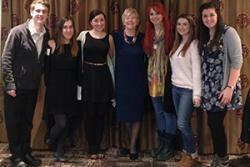 Left right: Jonathan Cliffe, Rosie Florence, Hannah Heffernan, Lesley Page, Royal College of Midwives President; Daisy Fenner, Sioned Jones & Samantha DaviesA student Society at Bangor University, which has only been in existence for five months, is in the running to receive a prestigious national Award. Student Midwives Samantha Davies, Jonathan Cliffe, Daisy Fenner, Sioned Jones, Hannah Heffernan and Rosie Florence, and the Student Midwife Society Committee Members at Bangor University, have together made it to the shortlist of the Student Midwife of the Year Award, run by the British Journal of Midwifery Practice Awards 2015. The winner of the award will be announced on 23rd March at the British Journal of Midwifery Awards ceremony in London. "The success of Bangor Student Midwife Society can be attributed to the passion of students to make change. It was that passion that drove students to organise their own conference which was attended by students and healthcare professionals, impacting their experience for the better. I'm incredibly proud to say I've worked with this group and I'm sure the next year will be another successful one for Bangor University students."